This is about the Forerunner constructs. For the UNSC AI type, see Navy Sentinel. For the achievement, see Sentinels (achievement). An Enforcer flanked by two Aggressors. Sentinels are autonomous machines created by the Forerunners, designed for the construction, maintenance and defense of their structures and facilities. Various Sentinel variants exist, each tailored to a specific task; because of its ubiquity, the Aggressor variant is often referred to simply as the "Sentinel". Most variants are produced by Sentinel manufacturing facilities, Sentinel shops, or Sentinel launchers. The Sentinels were revered by the Covenant as "holy warriors of the Sacred Rings". The Sentinels follow the command of the monitor or other ancilla that is in charge of the facility they are assigned to, but even without central direction, they are able to respond to threats against their assigned installations with remarkable coordination and effectiveness. On Installation 00, a sentinel defense network is used to coordinate the Sentinels on the Ark despite the monitor no longer being present. Sentinels follow their directives even if this entails engaging other Forerunner machines. For example, the Aggressor Sentinels of Requiem remained loyal to the Librarian against the Didact's Prometheans in 2557. Another instance is when the Constructors of Genesis remained loyal to Monitor Exuberant Witness against the Created's Promethean forces in 2558. The Aggressor is the most common form of Sentinel, designed for the protection of Forerunner constructs and the small-scale suppression of Flood forms. There are many forms of Aggressor, though most follow the same basic layout. In the event of a severe threat, an advanced version of the Aggressor would be dispatched to assist the more common Aggressors. Assemblers are presumably used to build and maintain Forerunner installations and technology, like the similarly named Constructors. Though they are not designed for combat, they will suspend their primary duties and engage Flood forms in the event of an outbreak. These turrets are portable and can be deployed. The Constructors are specialized Sentinels, designed solely for the construction and servicing of Forerunner structures. Like Assemblers, they are not designed for combat, but they will engage the Flood if necessary. These sentinels were typically used to defend valuable technology on Installation 00. Their typical weaponry is a supercharged sentinel pulse as their main weapon, with a Sentinel beam to cover their blind spot. For defensive purposes, they can create an energy shield on their forward side. This shield is significantly stronger than that of the Enforcer. A special variant of Sentinel was used aboard the Forerunner Capital for security purposes. They possessed black armor, matching the black-and-red armor of Ecumene Council security personnel. The Enforcers are equipped with a variety of offensive and defensive measures, including pulse beams, missiles, a last-resort Sentinel beam, and three frontal energy shields. They are designed to handle major Flood outbreaks, but are also capable of defending their Installation from other external threats. Gatherers seem to be deployed exclusively on Line installations, and serve as collectors of biological specimens for the resident Monitor. They have offensive capabilities similar to Aggressors. 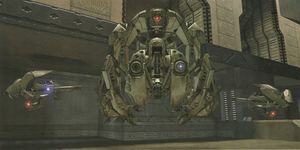 Roughly similar in appearance to regular Aggressors, Protectors are modular units capable of being modified into one of three variants: Offensive, which is a weaker version of the standard Aggressor; Shield, which projects an energy shield around its host unit; and Healing, which provides medical assistance to its host after combat. These types of Protector Sentinel were deployed on Installation 00, also known as the Ark. The Retrievers, otherwise known as the Strato-Sentinels, are massive terraforming machines, used to gather raw materials for large-scale Forerunner astroengineering projects such as the Halo Array. Onyx Sentinels both guard and make up the artificial planet of Onyx. They use a much more powerful individual energy beam than the Aggressor, and have the ability to combine and transform themselves in order to complete a specific task. Onyx Sentinels are far more formidable opponents than more widely-used "standard" variants. Fitted with powerful sterilization beams, the Safeguard Sentinels are highly efficient at containing and cauterizing intrusions into their assigned protectorate. Considerably larger than Aggressors, Super Sentinels fill the same role as the Enforcers - combating large-scale Flood outbreaks. The largest Sentinel variant seen to date, this Sentinel is able to level entire cities with its weaponry. The Watcher is a Sentinel variant used by Promethean Knights for combat support. They can heal and augment their damaged allies and return incoming ordnance such as grenades using a gravity-displacement beam. A Sentinel Defense Network is a system that coordinates sentinel defenses to perform their duties in defense of an installation. Installation 00 is the only installation known to have a defense network installed. Without the defense network activated, Sentinels are unable to perform their duties. This however, does not affect the stationary defenses, which remain active even if the defense network is shut down, including containment shields. The Defense Network itself is separated to local and global defense network. The local defense network only controls sentinels surrounding terminals, while the global defense network controls defenses on a global scale. The Defense Network is linked with every defensive protocol on the installation. Containment protocol on Installation 00 is linked with the Defense Network and Sentinels cannot conduct the protocol if the network is disabled. The Smart AI Isabel manipulated the Sentinel Defense Network to her own ends by hijacking Enduring Conviction and firing its energy projector on the Ark, causing Aggressor Sentinels to swarm on the ship and bisect it. Sentinels were seen in Halo Infinite's announcement trailer at E3 2018. ↑ Halo 2, campaign level The Arbiter - "A Whisper in the Storm"